PALMEIRAS DE GOIÁS, Brazil, Jan 4 2019 (IPS) - “Solar energy makes my happiness complete,” said Divina Cardoso dos Santos, owner of one of 740 houses with photovoltaic panels on the rooftops in a settlement on the outskirts of this central Brazilian city. “The first blessing was thishouse,” said the 67-year-old mother of five and grandmother of 14. 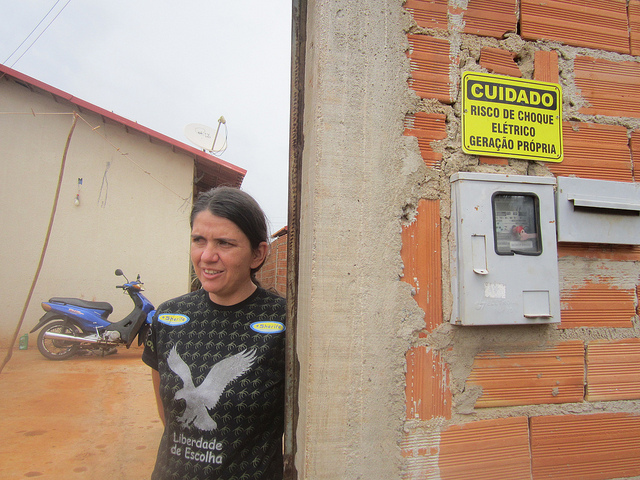 “I paid 600 reais (155 dollars) a month for rent in the city of Palmeiras, and now I pay monthly quotas of just 25 reais (6.50 dollars) for this house, which is mine,” she told IPS. Her retirement pension, which for the past two years has assured her an income equivalent to the minimum wage (250 dollars) a month, and visits from a daughter who lives in Switzerland are “other blessings,” which preceded the solar panels, which allow her to save almost the entire cost of the electricity bill – about 15 dollars a month. The Maria PiresPerillo Residential complex, a group of 740 homes that began to house poor families in 2016, is a social housing project of the Housing Agency (AGEHAB) of the state of Goiás, in west-central Brazil. Located two kilometres from Palmeiras de Goiás, a city of 28,000 people, it is the largest of the four residential complexes that AGEHAB will supply with solar energy. 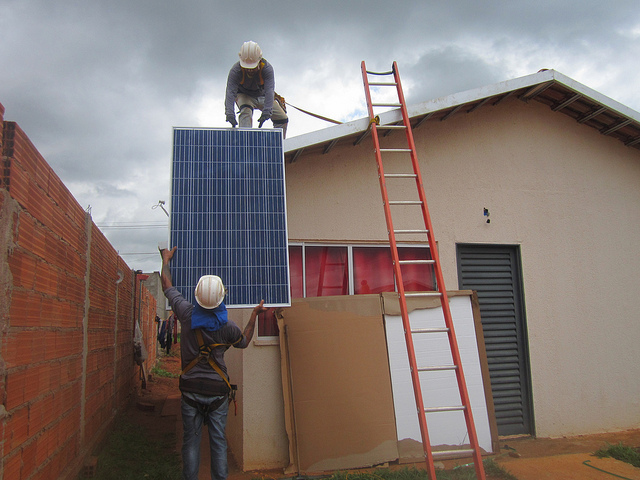 The agency is a pioneer in Brazil in includingsolar power in housing programmes. “We would like to build all the new housing complexes with solar panels and also install them in the ones built previously,” Cleomar Dutra, president of AGEHAB, told IPS. The agency subsidises the installation, granting 3,000 reais (780 dollars) to each family, through the”ChequeMaisMoradia”programme for the improvement of homes. The money covers the cost of two solar panels and the necessary equipment, such as inverters, cables and supports. But this year’s devaluation of the Brazilian currency, the real, drove up the cost of the panels and other equipment, which is almost all imported. Additional resources for the facilities in the Palmeiras complex, which are yet to be completed, had to be sought, said Dutra. “Not all of the houses will have solar panels, because some did not sign the financing contract for the ‘Cheque Mais Moradia’,” said Pedro de Oliveira Neto, the 32-year-old technician who runs the facilities at the Maria Perillo Residential Complex, installed by Nexsolar. Oliveira has been doing this work for the past four months, after taking a specialised course. Before that, he worked in the meat industry and in mining. Now he wants to stay in the field of solar energy, “which has a future, it’s innovation,” he told IPS. Actually, most of the houses in the complex have solar panels, but few of them generate their own energy. After they are installed, other conditions must be met in order for the local power company, Enel from Italy, to connect each home’s system to the grid. The process began in March 2017 when solar units were installed in three homes as a test. Patricia Soares de Oliveira, 31, married with an eight-year-old daughter, was included in that first installation. Her electricity bill fell to one-fifth of the previous one. Now she pays about four dollars a month. “We have two TV sets, a refrigerator, a washing machine, a computer and fans,” she told IPS to explain how much electricity they use. “Now we want to reduce the water bill, which costs us 10 to 12 times more than electricity,” she complained. Her family also no longer has to pay rent because they were granted a home in the complex. Whereas they used to pay 350 reais (90 dollars) a month they now pay just 25 reais (6.50 dollars) per month, the fee for the small portion of the financing that the owners have to pay. 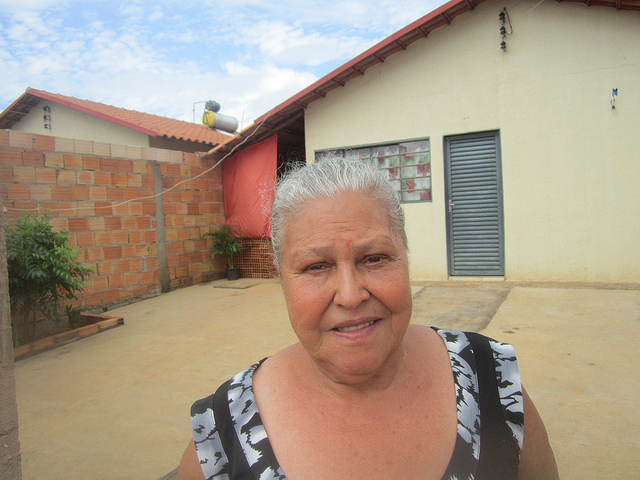 The low cost of the home is due to a subsidy of up to 20,000 reais (5,200 dollars) granted by AGEHAB, through the ‘Cheque Mais Moradia’ programme for construction, to poor families with incomes of up to three minimum wages (about 740 dollars), said Dutra, the head of AGEHAB. The families settled in the complex are only paying the complementary financing from the Federal Economic Fund, a government bank. “A 44-square-metre house, like the ones in the complex, are built with materials that cost 29,000 reais (7,500 dollars), but the cost can be reduced if the purchase is collective,” estimated Dutra. So the ‘Cheque Mais Moradia’ is insufficient, but almost enough. If the beneficiary families are in charge of construction, working together collectively, or if the mayor’s office provides the labour, the houses can be built practically without running up a debt, Dutra said. The housing complexes are aimed at the most needy local families, since AGEHAB does not have the resources to assist everyone, she said. Palmeiras de Goiás was included in the system because the population grew well above the state average, due to immigration. New meat, dairy and animal feed industries attracted many people looking for work. 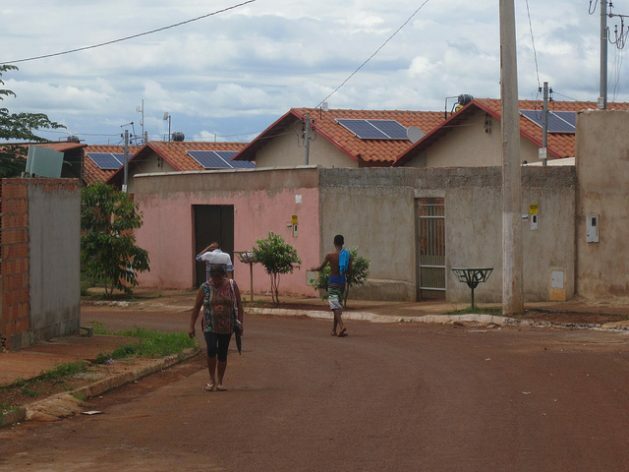 Generating electricity from solar panels is a novelty of the last two years in the Goiás housing programme, but solar energy was already used in social housing projects for heating water – there are solar boilers on every rooftop. It is a cheaper and more accessible technology, quite widespread in Brazil, even in the Northeast region, where people are not used to bathing with hot water, due to the high local temperatures. Photovoltaic electricity generation has immense potential in Brazil. In the Midwest, solar radiation from a 30-square-metre rooftop could produce five times the electricity consumed by a low-income family, estimated Dennys Azevedo, an engineer who is works manager at AGEHAB. That generation would be enough for 3.5 households consuming the national average, 157 kilowatts/hour per month, he told IPS. But the rules set by the National Electric Energy Agency (Aneel), the Brazilian regulatory body, do not allow consumers to sell the energy they generate. The only benefit they receive is that the energy that they generate and consume is deducted from their electric bill. The houses of the Maria Perillo Residential complex, for example, only have two solar panels, which occupy only about one-fifth of the rooftop. An additional panel would exceed the consumption of local families. That rule, which does not exist in countries that have greatly expanded solar generation, such as Germany, is difficult to eliminate because of “pressure from distribution companies that would lose market share,” said Azevedo. In addition, these power companies want to charge a tax for distributed (decentralised) solar generation, basically a tax for the use of the power lines, a cost that is currently subsidised, according to them. But “we’ve all already paid an availability tax” for the power grid, said the engineer. Another restriction is the importation of equipment not yet manufactured in Brazil. The prices depend on the exchange rate, and any devaluation of the national currency makes everything more expensive, making planning impossible, he argued. In addition, multiple expensive taxes raise the prices of solar equipment in Brazil, cancelling out part of the cost reduction for all solar energy components, said Azevedo, who explained that efforts are being made to avoid that taxation, “perhaps by buying equipment through the United Nations,” and to obtain funds for new projects.